Guided Boundary Waters Canoe Trips are Moose Track Adventures Guide Service’s forte. Moose Track Adventures is Ely MN’s premier guide service and offers a variety of Guided Boundary Waters Canoes Trips and Guided Quetico Trips. These guided canoe trips are designed for the novice up to advanced paddlers and will be customized to satisfy the group’s abilities and agenda. We also specialize in Guided Boundary Waters Fishing Trips and Guided Fly-Fishing Trips for Smallmouth Bass, Northern Pike and Walleye. Moose Track Adventures Boundary Waters Guide Service has a variety of different options to choose from. Our guides have extensive knowledge about fishing these waters and will take you where the fish are. Whether you are interested in Boundary Waters history, flora, fauna, fishing or fly-fishing, let Moose Track Adventures plan an unforgettable guided trip for you! 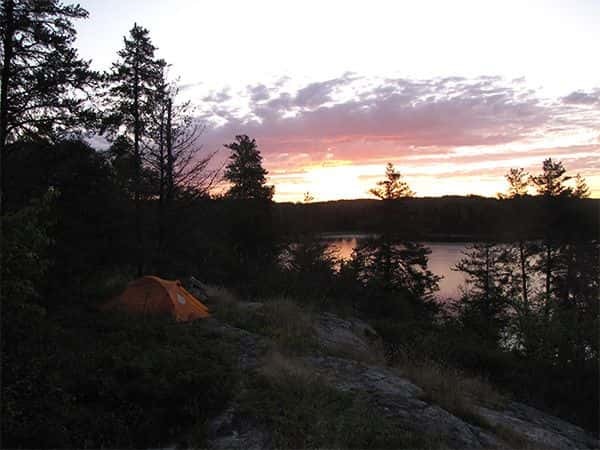 Boundary Waters All Inclusive Outfitted Guided Canoe Camping Trip – The whole kit and caboodle, our all-inclusive Outfitted Guided Canoe Camping Trip in the Boundary Waters is the superior choice when you want the best of the best. The moment you get to Moose Track Adventures in Ely everything will be ready. From your first night’s rest to your morning breakfast, we will take care of all the preperations. Once your group is all fueled the shuttle takes you and your camping gear to your predetermined Boundary Waters Entry Point. From there you will be guided by one of our expert wilderness professionals who will show you the sights as well as have you share in the responsibilities required to get through the rough country, testing your knowledge and endurance. When the last day has arrived, we will be at your exit point with cold beverages and a freshly made lunch. It’s truly Northern Canoe Country hospitality at its finest. BWCA Guided and Outfitted Canoe Camping Package – If you already have your accommodations for the first night before the trip but are still looking for Ely’s best full outfitting and canoe guide services, than our second Guided Canoe Trip Package is just the ticket. We provide all your trip essentials, such as food, tents, canoes, life jackets, permits, paddles and of course you get one of our finest fishing guides. We choose our guides selectively and you’ll thank us for it! There are so many benefits of taking an experienced guide with you on a Boundary Waters Canoe Trip – have fun, learn lots and experience Canoe Country with a professional guide by your side, so you don’t miss a thing. Ely Guided Fishing Day Canoe Trip – Make a day of it and bring one of our knowledgeable guides on your canoe trip. We will lead you through the tranquil waters and hook you up with the spots that bite. Enjoy a new experience and learn a thing or two you didn’t already know about the Boundary Waters or Ely with the help of Moose Track Adventures seasoned fishing and canoeing guides. Our day canoe trips aren’t always just about hooking a trophy – we focus around what’s brought you to Northern Minnesota, whether it’s purely for the paddling, wildlife, views, history, photographs or the fish. Whatever you want, we tailor your trip for you. Guided Eco-Tourism Day Trip – A custom guided Ely canoe experience like no other is our eco-tourism day trip. The rich history of the canoe country has been well preserved and our canoe guides have a passion for sharing their extensive knowledge of the Boundary Waters wildlife, vegetation, views and so much more. Immerse yourself in the beauty of nature untamed and untouched by contacting Moose Track Adventures for this special day trip out on a canoe. 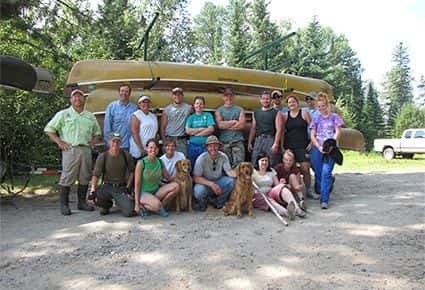 Custom Canoe Guide Service – Jim Blauch, an owner of Moose Track Adventures in Ely, MN, has a lifetime of experience in the Northern Woods. Prior to starting Moose Track Adventures with his wife and family, he has worked as a canoe and fishing guide for many other Ely Canoe Guide Companies and has actually developed the itinerary of specialized guided tours. These qualifications are what allows Moose Track Adventures to completely customize your guided canoe trip exactly to your liking. If you want your trip to focus on wolves, birding, photography, history, falls, fly-fishing, star gazing, or any other features, we have more than what it takes to create an experience you can truly appreciate. Less Portaging and more fishing, less fishing and more paddling, pictographs or howling wolves – it’s you trip and your choice on what you want to do. We can help you seek out whatever has you gravitating to the Boundary Waters, show you added beauty and share with you the history of this mesmerizing land along the way. Contact Moose Track Adventures for superior Boundary Waters Canoe Guide Services in Ely today at 218-265-4106. Learn More About Your Hosts. Ely, MN Guided Fishing Trip Expert.